GWNY150a, a photo by jankor on Flickr. 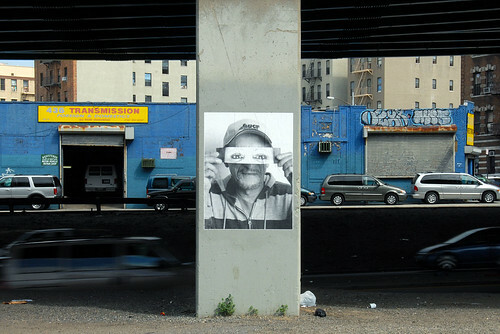 Paste-up under the Bruckner Highway in The Bronx, New York, NY, by the artist JR for his "Inside Out Project". See more here in my Street Art set. 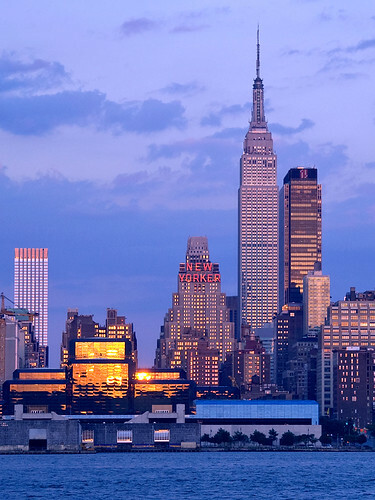 Sunset at Javits, New Yorker, Empire State Building, a photo by jankor on Flickr. The sun sets after a hot summer day and dips New York in fiery colors. A calm Hudson River flows along Manhattan's West side in front of the Javits Convention Center, the New Yorker Hotel, and the Empire State Building. 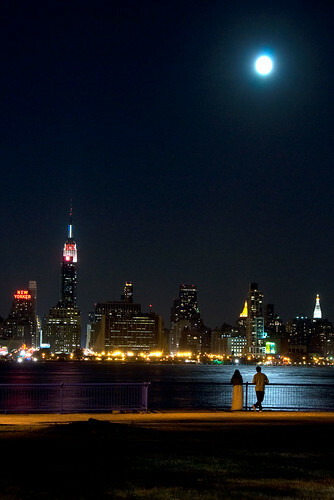 Full Moon over Manhattan, a photo by jankor on Flickr. 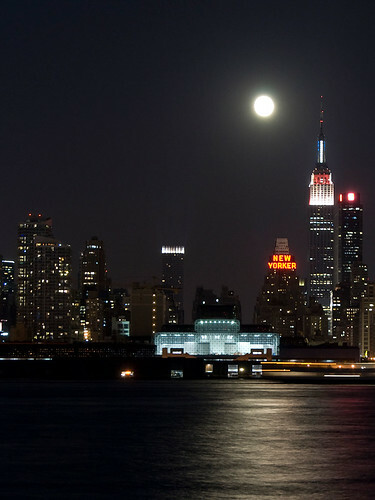 The full moon rises over Manhattan, New York, NY. A calm Hudson River flows along Manhattan's West side in front of the Javits Convention Center, the New Yorker Hotel, and the Empire State Building. New Love in New Jersey, a photo by jankor on Flickr. WTC from Jersey City, a photo by jankor on Flickr. Longing over the Hudson River, the new World Trade Center in Lower Manhattan, New York, NY, seen from Jersey City, NJ. 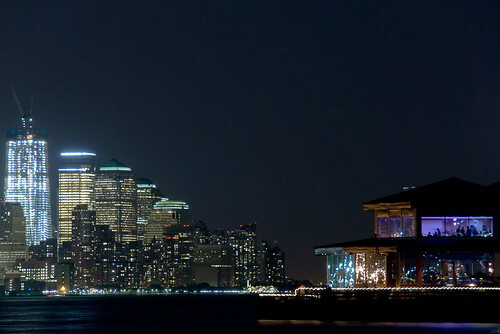 WTC from Weehawken, a photo by jankor on Flickr. 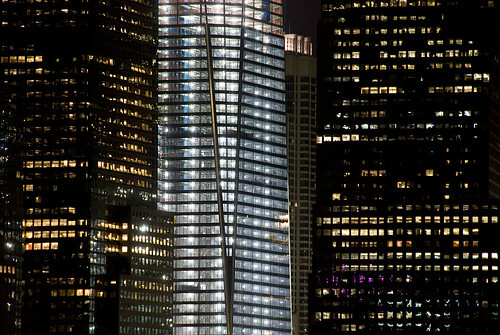 The new World Trade Center is rising in Lower Manhattan, New York, NY. Seen at full moon from Weehawken, NJ. See more of my night shots of the full moon shots on my flickr page. Atlantic City, a photo by jankor on Flickr. 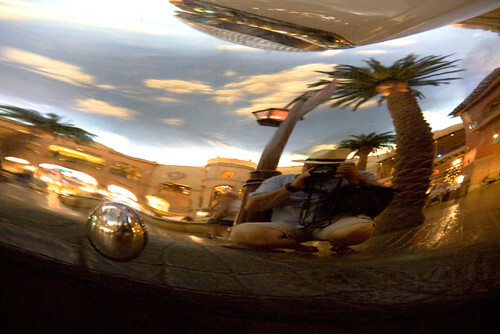 Self portrait in the bumper of an old cruiser in Atlantic City. This sky is no sky at all, it's a painted illusion on the ceiling of the "Tropicana Quarter". Everything here is fake but the car - and me, for sure. See more of my shots on my flickr page. Happy 4th of July: A grocery in Peekskill in upstate New York on the Hudson River Valley wishes all best for Independence Day 2011.